Floating on a bed of soft white clouds, your Lucky Angel awaits you. The golden coins that surround her could be yours as you play this lighthearted game. Golden bells, celestial hearts and playful cherubs are all part of this little piece of heaven. With a wing and a prayer you can test out your archery skills in the Angel Heart Bonus. The treasures are all yours as golden tipped arrows strike floating hearts in the sky. Who can resist the game of love when you have a beautiful angel by your side? 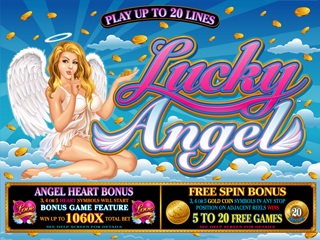 3, 4 or 5 Love Heart Symbols will start the Angel Heart Bonus where you can win up to 1060x your Total Bet. 3, 4 or 5 Gold Coin Symbols in any position on adjacent reels will award up to 100x Total Bet plus 5 to 20 Free Spins.